Over a year ago at the Winning Poker Network, we started accepting Bitcoin for deposit and withdrawals, receiving a tremendous response from our players. Now, what we’ve done for an encore has really changed the game for payment processing! Americas Cardroom and Black Chip Poker are now leading the pack in cryptocurrencies. Withdrawals will be coming coming soon. We are the only poker network in the world to offer this level of functionality. Why have so many cryptocurrencies? We don’t know which one will ultimately emerge as industry leader and want to give our players as many choices as possible. This is also our way of supporting blockchain technology, and be the worldwide leader in payment processing solutions. If there’s a specific cryptocurrency you’ve been betting on, good news. You can now deposit using over 60 different ones at Black Chip Poker! 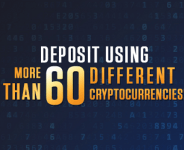 These new cryptocurrencies are only currently accepted for deposits at Black Chip Poker and Americas Cardroom. Shortly players wil be able to make withdrawals too (for now, feel free to withdraw in US dollars).